As an integral part of the traditional Chinese culture, the ancient marriage customs have a long history of over 5,000 years, which have changed over time due to different social ethics and aesthetic standards from one dynasty to another, however, they also have their own unique characteristics and rituals which have been carried forward to the present and still exert a far-reaching influence on later generations. The ancient Chinese marriage customs have gone through five stages over 5,000 years: primitive group marriage stage, consanguineous marriage stage, exogamous marriage stage, antithetic marriage stage and the monogamy marriage stage. In the primitive society, the ancestors of the Chinese people lived in groups and had no fixed spouses, and they had sexual relationships indiscriminately with one another. Owing to their weak gender awareness, they didn&apos;t felt ashamed and weren&apos;t bound by customs and etiquettes. 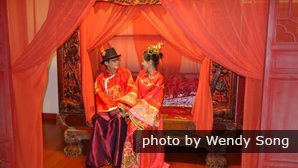 As the first marriage taboo in Chinese history, consanguineous marriage emerged during the middle Neolithic Age, which banned a parent-offspring marriage but allowed the marriage of people of the same generation (such as the brother and sister of a family). The representative consanguineous marriage was between Fu Xi (one of the Three August Ones and the Five Lords) and Nv Wa, who were blood brother and sister. As the second marriage taboo in Chinese history, exogamous marriage emerged in the middle and late Neolithic Age, which strictly banned the marriage between blood brothers and sisters, and it only allowed marriage among different social groups. In the exogamous marriage stage, it was very common for the brothers of the same family to marry a wife from the other group, and she would be the wife of all the brothers in the family, and vice versa. The legend went that Shun (one of the Three August Ones and the Five Lords) married Yao&apos;s daughters, Ehuang and Nvying, at the same time. As a transitional stage from the exogamous marriage stage to the monogamous marriage stage, the antithetic marriage (or paired marriage) was an unstable marriage between men and women during the late Neolithic Age, which was very different from modern monogamy and easily dissolved; and it retained some vestiges of group marriage with tolerance toward a husband&apos;s or wife&apos;s extramarital relationships. As the patriarchal social system took place of the matriarchal social system, the private ownership of property came into being, on which the ancient monogamous marriage was based. In the ancient monogamy marriage stage, the husband owned everything in the family, including his wife, children and property, and the main task of women was bearing children to carry on the paternal lineages. According to Confucianism, a marriage is the beginning of ethics and a wedding ceremony is the essence of etiquettes, which has a substantial influence on social stability, and only those marriages with formal wedding ceremonies are recognized by society. The basic principles of an ancient marriage mainly involved the matched social status, the dictates of the parents and the advice of the matchmaker, the ban of the marriage for a couple with the same surname and the tolerance toward polygamy. The marriageable age was 20 for males and 16 for females in ancient China, and an ideal standard of marriage was well-matched in social and economic status for the two families. In the Western Zhou Dynasty (1046 BC-771 BC), the intermarriage between noblemen and commoners was absolutely forbidden by law. The implementation of the nine-rank system in the Wei （220-265）, Jin (265-420), Southern and Northern Dynasties (420-589) resulted in a rigid feudal hierarchy system, making it impossible for a noble to get married with a commoner. Although it was superseded by the civil-service examination system in the Sui Dynasty (581-618), it was still a tradition for the concerned parties to get matched according to their social and economic status, which was followed by the Tang (618-907) Dynasty to the Qing Dynasty (1644-1911). Free love was absolutely banned in ancient China and was widely condemned as an offence to public decency according to the traditional Confucian ethic codes, so it was the task of parents to arrange marriage for their children in order to maintain order of the traditional patriarchal society. Not only was the arranged marriage formally favored by society, but it was also politically supported and enhanced by law in ancient China. As a matter of fact, the marriageable boy and girl were supposed to obey the dictates of their parents and follow the advice of the matchmaker on the arranged marriage pattern. Having never seen each other before their wedding day, this resulted in numerous unequal and loveless marriages. The forbidden marriage policy on people bearing the same surname was launched and carried out in the Western Zhou Dynasty (1046 BC-771 BC) to guarantee a clear feudal patriarchal hierarchy and order of inheritance (such as the throne and property). People of the same clan and surname were not allowed to get married in the Tang Dynasty (618-907), especially among members of royalty. The law interdicted the intermarriage between people of the same clan in the Ming (1368-1644) and the Qing (1644-1911) dynasties; however, it allowed people of the same surname but of different clans to get married. Generally speaking, it was a traditional national policy to carry out feudalistic monogamy in ancient China, however, the traditional Chinese culture didn&apos;t prohibit or explicitly encourage polygamy (a man and multi women). It was tolerated for a man to take concubines other than his primary wife, but only the upper and middle class men could afford it owing to their affluent resources. The traditional marriage customs, to a large extent, reflect the traditional Chinese culture, which varies from one area to another and even from one dynasty to another. Six rituals of the traditional Chinese marriage customs have essentially remained over time, known as “Three Letters and Six Etiquettes”, which are passed down from one generation to another. The Three Letters refer to the betrothal letter, the gift letter and the wedding letter, each of which is used in a different ritual of the marriage. Betrothal Letter: an official contract of a marriage between the two families. Gift Letter: a letter with a list clearly defining the kinds and quantities of the attached gifts. Wedding Letter: an official letter welcoming the bride to the bridegroom&apos;s home. The six etiquettes (proposing marriage, matching birthdates, submitting betrothal gifts, presenting wedding gifts, selecting a wedding date and holding a wedding ceremony) have been adopted in the traditional Chinese marriage customs since the Western Zhou Dynasty (1046 BC-771 BC), which shows that Chinese people attach great importance to marriage and are somewhat superstitious. Proposing Marriage: the marriageable boy&apos;s parents asked a matchmaker to propose to a potential girl at the girl&apos;s home. Matching Birthdates: if the proposal went well, the matchmaker would inquire about the four pillars of birth time (referring to the year, month, day and hour of birth respectively, known as Bazi in Chinese astrology) of the couple-to-be and submitted it to a fortune-teller to predict their future. If the fortune-teller said it was ok, the marriage ritual would continue. 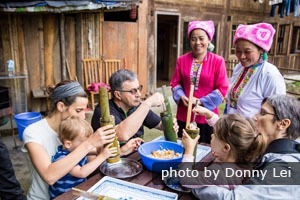 Submitting Betrothal Gifts: after the matchmaker informed the girl&apos;s parents that the birthdates of the couple-to-be matched, the boy&apos;s parents would arrange and submit betrothal gifts to the girl&apos;s family with the betrothal letter. Among the submitted gifts, a wild migratory goose was considered the most important one in the Western Zhou (1046 BC-771 BC) and the Han dynasties (206 BC-220) due to it representing steadfast love. Presenting Wedding Gifts: If the betrothal gifts were accepted, the boy&apos;s parents would present wedding gifts to the girl&apos;s family, which was the grandest one of the six etiquettes. The wedding gifts usually included cash (silver), jewelry, cakes and sacrificial articles. 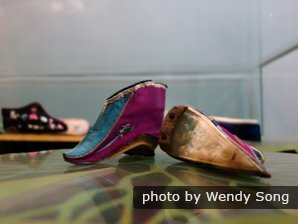 The boy&apos;s parents selected a wedding date through the art of divination and solicited agreement of the girl&apos;s parents. If both parties didn&apos;t object to the date, the girl&apos;s party would deliver the bride&apos;s dowry to the bridegroom&apos;s house at least one day before the wedding ceremony. The traditional dowry included jewelry, scissors (symbolizing the couple would never separate), a ruler (symbolizing thousands of acres of fine land), a slab of sugar (symbolizing the sweetness of a happy marriage), a silver purse (symbolizing wallowing in money), a vase (symbolizing richness and honor), shoes (symbolizing the couple would remain happily married to a ripe old age), quilts, pillows, clothes and lotus petals (symbolizing the couple would have many children). 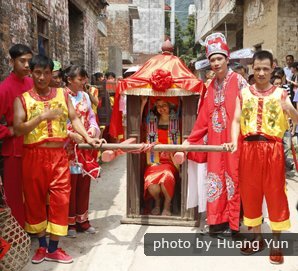 It had become a custom to welcome the bride at her home and carry her to the bridegroom&apos;s home in a bride&apos;s sedan since the Western Zhou Dynasty (1046 BC-771 BC). The wedding ceremony would be held at the boy&apos;s house, before which the bridegroom was supposed to welcome the bride at her home, and he would then take her as his wife. It was also a custom for the bride and bridegroom to perform bows (kowtow in Chinese) three times before entering their nuptial chamber, each of which had its unique meaning: the first one was for heaven and earth, the second one was for their parents and the third one for their spouse. The bride was covered with a red veil over her head on the wedding day, which symbolized her virginity, pureness and youthfulness, and it was the bridegroom who removed the veil from the bride&apos;s head, thus they became husband and wife formally. 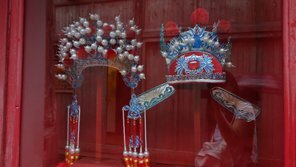 There were many taboos concerning ancient Chinese marriage customs in history, some of which were superstitious, some were funny and some were impressive, and here are some for your reference. A virgin boy was supposed to sleep with the bridegroom on the connubial bed on the night before the wedding night, and it was said that it would bring good luck to the couple in the future. People who were born in the year of the tiger were not suitable to attend the wedding ceremony. The aunts and sisters-in-law of the bride weren&apos;t allowed to see the bride on her wedding day. The louder the bride cried on her wedding day, the better. On the wedding day, the guests weren&apos;t allowed to sit on the connubial bed. The dress the bride wore on her wedding day was supposed to be without any pockets in order to be unable to take away her own father&apos;s luck for wealth. The bride shouldn&apos;t lie in a sprawl on the bed on the wedding day, or she would be confined to bed by illness. The bride&apos;s mirror was not supposed to be lent to others. The bride was not supposed to sleep outside of her home within four months of her wedding. The bride was not supposed to attend any funeral ceremony within four months of the wedding. 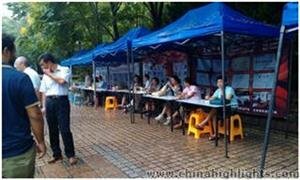 The Shanghai Marriage Market – An engrossing experience!